With temperatures above 20 C degrees, summer hit Denmark in the last couple of days. Lying in the sand, playing beach volleyball or having a BBQ on the coast? 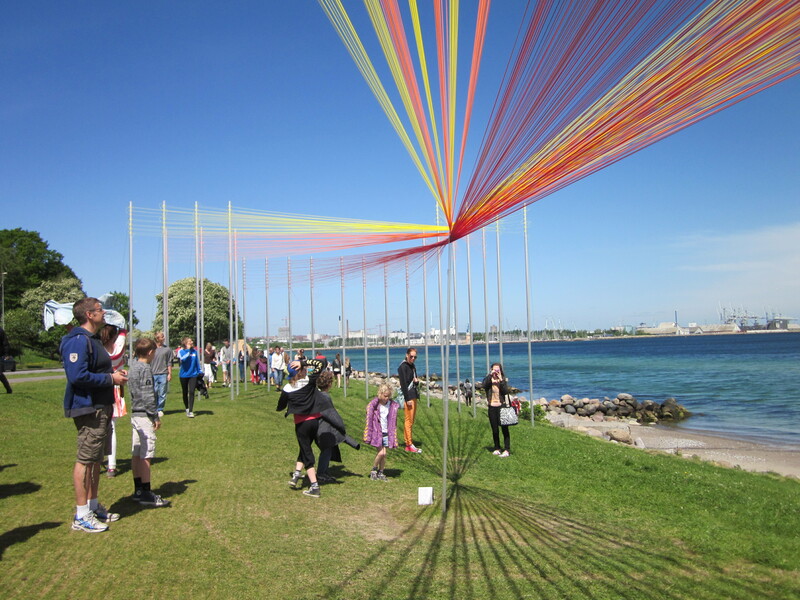 Now you have one more option on the to-do-list – visiting the Sculpture by the Sea Aarhus and enjoying an unique experience of art and nature melting together. The three-kilometer-long coast from Tangkrogen to Ballehage has turned into an outdoor art gallery for the whole month of June. Artists from 22 countries present installations on the beach, the waterfront and in the forest. Sculpture by the Sea Aarhus is a special visual arts event in Denmark, being its biggest and most unique outdoor exhibition. The concept originated from Australia when it was first created by David Handley and launched in 1997 in Sydney. When the Crown Prince Frederik and Crown Princess Mary visited the Sculpture by the Sea exhibition in Sydney in the year 2000, they were fascinated by the interplay between the sculptures and the coastline. The Royal couple brought the idea back to Denmark. The beautiful sea with the forest behind makes the scenery in Aarhus very unique. 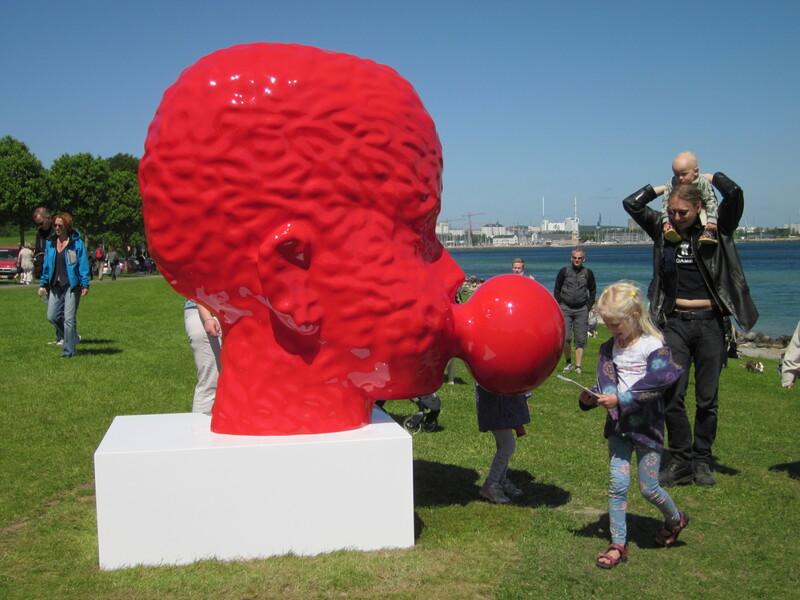 The first exhibition took place in 2009 and this year is the 3rd biannual Sculpture by the Sea in Aarhus. “This year the committee, the board, and the judges have focused on raising the artistic level, therefore, we are convinced this year’s Sculpture by the Sea is the best ever”, says Jens Erik Sørensen, director of ARoS Aarhus Museum of Modern Art, in his speech at the opening ceremony. Around 600 proposals have been submitted to this year’s exhibition, of these 64 have been selected by the jury. Compared to previous years, there are more works specially made for this exhibition and Aarhus. Don’t feel surprise when you see a landfill site here on the beach. It’s the installation from the Australian artist Gary Deirmendjian. 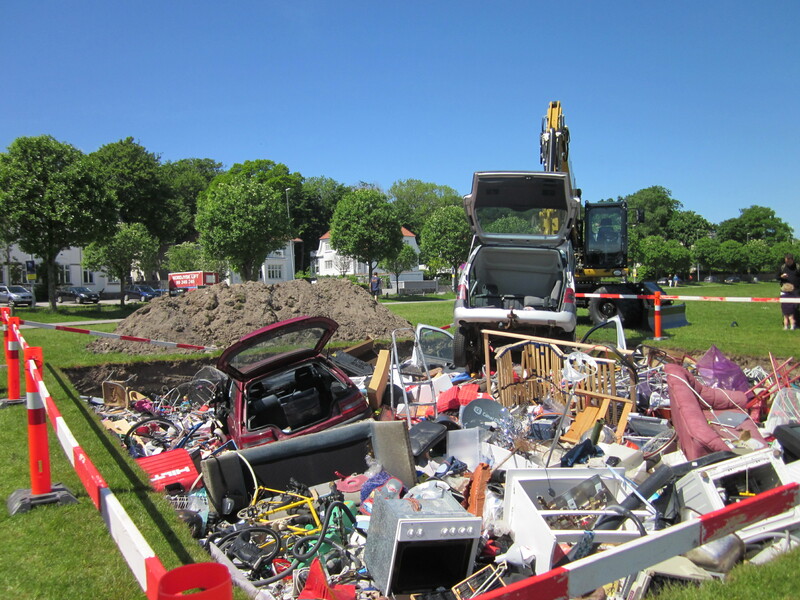 Every piece of the rubbish mountain is collected from residences in Aarhus. Some are from the streets, but most of them are “rescued” by the artist and his team before they are burnt to provide electricity and heating to the city. The hole is filled up with a wide range of stuff including dolls, Mac Books, cars, and suitcases. “Tangkrogen is actually a landfill site before the water came all the way here”, says Gary. He wants to show the background of Tangkrogen, but more importantly, he wants to suggest the notion that no action is free of consequences. How driven mass consumption results in mass production and mass disposal. The site is a square patch (10m × 10m) which is aligned with the global axis rather than the streets. “The idea is, it might be the local rubbish, but it’s an international problem”, says Gary. The Argentinean sculptor and architect Alejandro Propato has experience in making art on the beach as he already took part in Sculpture by the Sea in Australia in 2009 and 2010. His debut work in Aarhus is dedicated to the beautiful sunrise. “I was looking at pictures of this place on the Internet to get some inspiration, and I saw someone taking a picture of the sunrise. This picture made me think it would be nice to make a representation of the sunrise. Then people here can have sun all day long”, Alejandro explains his work “Permanent Sunrise”. Alejandro likes to use vibrant colors. In this work he uses the color of the sun, yellow, red and orange. He tried to keep the colors simple. “When you are inside, the three colors mix, you get more colors. If I make more colors, there will be no surprise for you when you enter,” says Alejandro. Alejandro emphasized the movement of the people in connection to his works. “Traditionally sculptures are like objects. For me this concept is very old.” That is why Alejandro makes an open sculpture to leave the space for people to be in and out. The sculpture can be viewed from different angles. Through the free movement, people can get different visual effects from the nylon wire. Qian Sihua’s sculpture Bubble No.5 was chosen for the poster of this year’s exhibition. “I feel so lucky”, says the Chinese sculptor. His work is easy to interpret – a boy is blowing a bubble. However the message behind is very philosophical: every beautiful thing has a balance point. “Like chewing the bubble gum, if you blow too hard, the bubble will be broken,” Qian explains. Qian says he applied the traditional Chinese concept Qi, translated as “life energy”, into his work. The wrinkles on his head embodies that all the energy in his head is transmitting to the bubble. However this piece also contains the special Danish elements. The red sculpture and the white base are the color of the Danish national flag. The wrinkles on head of the kid also echo the waves in the sea. The exhibition is free to the public and lasts until June 30th 2013, more information here. They have Sculptures by the Sea here in Sydney as well. Good to see that both my beloved cities have something in common!